Enjoy the beautiful Eastern Sierra with a weekend of quilting, fun, food and friends. We welcome Linda Ballard back for our 22nd Mystery Retreat. No one knows ahead of time what quilt we are making. The pattern is a surprise that will be revealed sometime during the weekend. The Mystery is what makes this weekend so great. Basic instructions are given as to what type of fabric to buy and how much. Some pre-cutting is required. 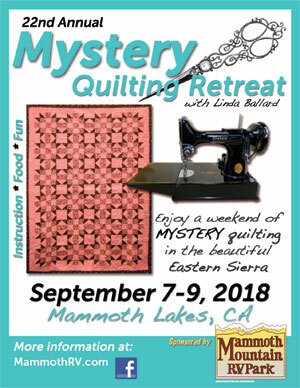 This retreat is for all levels of quilters. The retreat includes 3 days of sewing, four meals, block drawing, door prizes, instruction booklet, assistance by Linda Ballard and much more. Dates: September 7-9, 2018. Instruction starts at 2pm on Friday. Doors open at noon. Confirmations will be sent via email after receipt of registration. Instructions, supply list, yardage requirements and itinerary will go out in June 2018 if total amount has been paid. Where to Stay: Camp and stay in your RV on site! There are also many local hotels and condos close to the venue. Cancellations: Cancellations must be in writing by August 15, 2018 in order to receive a refund. All cancellations will be charged a $15 processing fee. Join our Facebook Mammoth Mystery Quilters Group for updates, quilts, photos and more!